Do you sell products or services online from your WordPress blog/site? Do you want to increase your sales and explode your profits by using an affiliate program? Do you want to have your own affiliate program so you can cut the middle man and build your own brand? 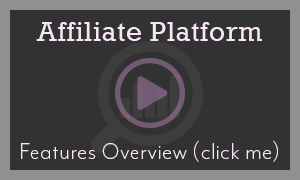 The WordPress Affiliate Platform is an easy to use WordPress plugin for affiliate recruitment, management and tracking that can be used on any WordPress blog or site. This plugin lets you run your own affiliate campaign/program and allows you to reward (pay commission) your affiliates for referring sales. The admin can configure banners, links and creatives which the affiliates can use on their site to drive traffic to your site. All the clicks, leads, sales etc are tracked by this plugin. If you are running online ad campaigns for your products and services then you can use the affiliate platform plugin to measure the true conversion rate of each campaign to find out the profitable ones. This allows you to weed out the non-profitable campaigns and save money in the process. Launch your affiliate campaign in a short time. Monitor clicks and conversions of visitors sent by your affiliates. Maintain your brand with your own product Ad Banners, Links and Creatives. Drive more traffic to your landing/sales page from your Affiliate’s site. Significantly BOOST revenue with more sales. We use this plugin to run our affiliate program and it has had a positive effect on our product sales. Easy installation like any other WordPress plugin and very easy to use. Seamlessly integrates with your website’s look and feel. Real time reporting. All data (clicks, sales, commissions) are tracked, computed and displayed realtime with no delay. Affiliate commissions are calculated accurately and awarded to the affiliate after a confirmed sale. Can be configured to use as a two-tier affiliate structure. View your affiliate details, commission level, account status etc. Easily change commission, edit affiliate details, view affiliate referrals, commissions and much more. Your affiliates will be able to create an account, log into their affiliate account and get ad code, view referrals, commissions and payout details. You can offer text and image ads to your affiliates. Your affiliates will be able to copy the ad code and use it to refer visitors. You have the ability to offer creatives (pre written text copy that) to your affiliates. Your affiliates can use it to promote your products easily. It comes with a built-in link generation tool in the affiliate area. Your affiliates can use this tool to generate referral link and share it easily via email, facebook, twitter etc. You can offer one time signup bonus to your affiliates. This can help you attract more affiliates to join you. It can be integrated with Autoresponders (AWeber, MailChimp, GetResponse, Mailpoet, Madmimi). This way the affiliates automatically get added to your list/campaign for email marketing purpose. No limit on the number of affiliates you can have and no monthly fees to use this plugin. Have as many affiliates as you want! You can choose to manually approve each affiliate account. There is also an option to send the affiliate an email when you have reviewed the application and approved the account. You can configure email notification that will be sent to your affiliate and you, when an affiliate receives a commission. Ability to enable or disable $0 commission recording. If the commission from a transaction is $0, you will be able to show or hide it. Ability to show the EPC (Earnings Per Click) data to your affiliates in their affiliate portal (under the sales menu). Ability to export all your affiliate commissions data to a CSV file so you can view it using Excel. You can export your affiliate leads data to a CSV file also. When you buy the WP Affiliate Platform plugin you can use it on as many sites as you own (you gotta love that!). There is no “Developer Option” here. One low price entitles you to use the plugin on all of your sites. Integrates with most WordPress shoping carts including WooCommerce, eShop, Shopp plugin, Cart66, WP Shopping Cart etc. Check the integration section on our documentation page to see the full details of the available pre-made integration options. Fully integrates with the WordPress eStore (WordPress Shopping Cart) plugin. Selling products from your WordPress site using the WP eStore plugin is quick and easy. You can easily integrate this affiliate plugin with PayPal buttons that you create from your PayPal account. It can work for both one time and subscription PayPal payment buttons. 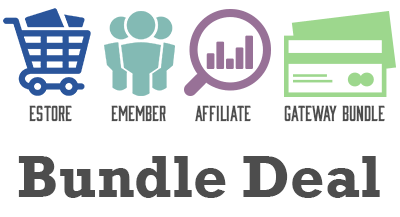 Affiliate platform integrates with some hosted shopping carts like e-Junkie, FoxyCart, Ecwid etc. Check the integration section of our documentation page to see the full details of the available integration options. The affiliate plugin easily integrates with the WooCommerce plugin. When your customers complete a sale via Woo Commerce, the plugin awards the commission to the appropriate affiliate (if any). You can also integrate WooCommerce coupons with this plugin to track and award commission based on the coupon that was used in the transaction. Can be easily integrated with the GetShopped WP-eCommerce plugin. You can view the WP eCommerce plugin integration details on our integration documentation page. Can be integrated with the Gravity forms plugin to capture leads referred by your affiliates. It also integrates with their pricing fields option. Can be integrated with the WishList Member plugin (Create Membership Site) when using PayPal buttons. Developers can integrate the wordpress affiliate plugin with any shopping cart or a plugin via the API (read the 3rd party integration post to understand what is involved in such an integration). Affiliate Platform plugin works with https pages out of the box (useful if you are using an SSL certificate on your website). View the full list of WP Affiliate plugin features. Please make sure you visit the demo and the documentation page so you understand the capability of this plugin. Do not assume that this plugin will magically work with a 3rd party plugin/solution that is not listed in the “Integration” section of the documentation page. Contact us if you are unsure about something and we will try to clarify it for you. I meant to say this the other day: your customer support is EXCELLENT! Pre-sales or post sales, you always get back – it’s such a pleasure to work with you! Combined costs for both products is a steal for the amount of functionality I get. A forthcoming review on my site will reflect that – I hope I can support you any way I can. Get the Affiliate Software now and start building your sales army! 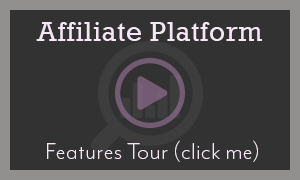 Like WordPress Affiliate Platform plugin? Why not sign up for an affiliate account and promote it to make some money? @Kim, you send the payment manually at a regular interval (for example: 2 weeks after the month ends). You can review the commissions before you payout. Does this plugin also pay the commissions to the affiliate? If they use their link to purchase an item in the shop, the affiliate gets their commission in their account, is it automatically put into their paypal account or do I have to send the payments manually? @Henk, This plugin is for users who are selling products from their own site and want some affiliates to promote their products. @Vespa, Yes you can have different affiliate commissions for specific affiliates. However you will need to go in and manually change their commission rate. Can I have different commission rates for different affiliates? I have some top earning affiliates that I want to give a better commission to can this be done? @Dave, Yes you are correct. The same can be done for WooCommerce also. That notification of a sale in the morning is the best feeling ever. My sales have gone up since I added this plugin as I am getting more referral traffic.